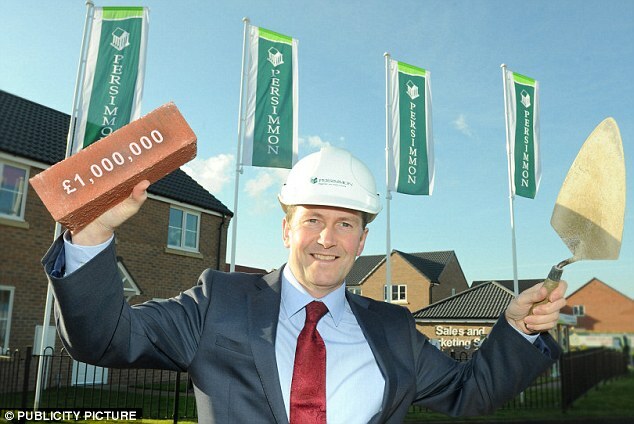 A housebuilder whose boss was dubbed ‘Mr £131million’ over the potential size of his bonus has beefed up its pay committee as it battles to draw a line under the row. New Persimmon chairman and boardroom veteran Roger Devlin will join the committee along with non-executive director Rachel Kentleton. The move comes days before chief executive Jeff Fairburn is handed the final tranche of a bumper bonus that at one stage was worth £131million. Persimmon is due to pay a dividend of 110p per share to investors on Monday – taking the total paid to 620p a share, or £1.9billion since 2012. The payment will trigger a share award to 52-year-old Fairburn worth £37million under a controversial long-term bonus scheme agreed in 2012. That follows a £44.9million payment last year. Persimmon has faced a fierce backlash over the scheme that will see 133 managers share hundreds of millions of pounds. Critics claim Persimmon’s success is partially down to the Government’s Help to Buy scheme, which aids Britons buying their first home. Labour MP Rachel Reeves, chairman of the House of Commons business committee, this month said executive pay at Persimmon was ‘a tale of corporate greed and incompetent pay management financed on the back of a taxpayer-funded housing scheme’. The firm’s shareholders have grown concerned over the sheer scale of the bonuses and damage to the company’s reputation. Devlin, who is also chairman of William Hill, joined Persimmon this month and will be paid £300,000 a year. Kentleton, 49, is finance director of PayPoint and has been on the Persimmon board since 2015. A qualified accountant, she has also worked for a range of firms including EasyJet, Natwest and Unilever. JD Sports chief Peter Cowgill faced shareholder mutiny over his £2.3million pay package. Almost 15 per cent of investors voted against a pay report yesterday at the company’s annual general meeting. They had been urged to rebel by influential advisor the Pensions and Investment Research Consultants. It comes after a revolt last year when one in five shareholders voted against Cowgill’s 10 per cent rise in salary. The executive chairman’s pay this year had fallen 17 per cent from £2.8million, but he still trousered a £767,000 salary, £2,000 in benefits, a £1.5million bonus and £488,000 in performance pay.